Delivery of 91 PC-12 NG single engine turboprops in 2016 make it officially the top-selling turbine-powered business aircraft in the world. With 91 aircraft delivered to customers around the world in 2016, the PC-12 NG outpaced sales of all other individual models of turbine-powered business aircraft. In mid-2017, Pilatus will deliver the 1,500th PC-12. At this year’s “Annual Industry Review” press conference, the General Aviation Manufacturers Association GAMA released its 2016 Year-End Aircraft Shipment and Billings report to the public. While overall industry shipments of turboprops and business jets declined by 3% relative to 2015, Pilatus increased sales of its popular single-engine PC-12 NG turboprop by 30%. 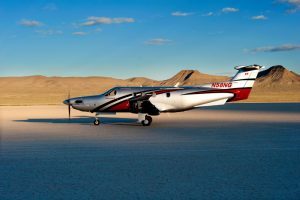 New features in the 2016 PC-12 NG increased cruise speed to 285 KTAS (528 km/h), reduced cabin noise levels, offered updated interior design options, and featured more than a dozen drag reduction changes to the airframe, increasing both range and speed. These enhancements were well received in the market, with demand high across the global Pilatus sales network…. This entry was posted on Monday, March 20th, 2017 at 11:58 am. Both comments and pings are currently closed.